When we first signed the Donnas, we didn’t know what we were getting! They seemed super cool, with fun, Ramones influenced songs of teen rebellion like “Let’s Go Mano” and “Get Rid Of That Girl.” We didn’t know, and they didn’t know that their 1998 record for Lookout!, “American Teenage Rock and Roll Machine,” would send them into the media mainstream and find them shaking up their movie trailer while Marilyn Manson knocked on the door and Carol Kane complained about the noise! Well, success breeds jealousy, and people were quick to say that the Donnas were a fabrication. Nothing could be further from the truth. The story of the Donnas starts with four families moving to Palo Alto, a city just south of San Francisco. First they were Ragady Anne, ripping it up at the school talent show at age 14, covering songs by Shonen Knife, Syndicate of Sound, The Muffs & L7. Then they were The Electrocutes, a punk rock riot grrl influenced foursome. They would practice in Donna C’s garage, and boys from their school would come by to watch and openly insult their band. “It sucked,” Donna F remembers. They were always unpopular in school. Then they became the Donnas, with the help of Darrin Raffaelli, who had written some songs which they recorded for his label, Super*Teem Records. They put out a full length and three 7″s on Super*Teem, all of which are now out of print, highly collectible items. By the time 1999 rolled around, The Donnas were recording their third full length studio album, Get Skintight, an album completely written by the Donnas, except for their Motley Crue cover, Too Fast for Love. Their metal influenced arena rock sound has brought them glory, fame and fortune! MEGA ROCKSTARDOM is next on The Donnas’ four point plan for conquering your heart! 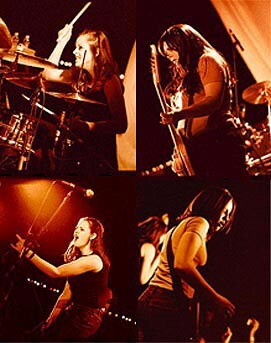 Visit the official The Donnas site at http://www.thedonnas.com!